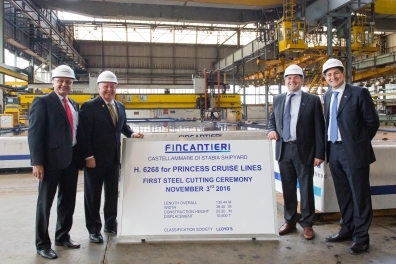 SANTA CLARITA, Calif. (November 9, 2016) — The steel cutting ceremony of the bow section of the fourth Royal Class ship for Princess Cruises was held Nov. 3 at Fincantieri shipyard in Castellammare di Stabia, Italy. This new build design follows sister ships Royal, Regal, and Majestic Princess, and is scheduled for delivery in 2019. (From left to right) Firouz Mal, Newbuild Project Manager, Keith Taylor, Executive Vice President of Fleet Operations, Elio Autiero, General Manager of Human Resources and Carlo Febbraro, Director of Shipboard Technical Personnel, at the steel cutting ceremony.